Eggs, poached --- 12 ea. Mix TABASCO Sriracha Sauce with cheddar cheese sauce; set aside. Cook bacon in a frying pan over medium-high heat until crispy. Remove from pan and chop; set aside. Cook sausage meat in a frying pan over medium-high heat until browned and crumbly. Spread Sriracha-cheddar sauce mixture onto prepared crusts. Layer mozzarella, chopped bacon, sausage crumbles and jalapeños on top. Bake 14 to 16 minutes. When pizzas are done, remove from oven and place poached eggs on top. 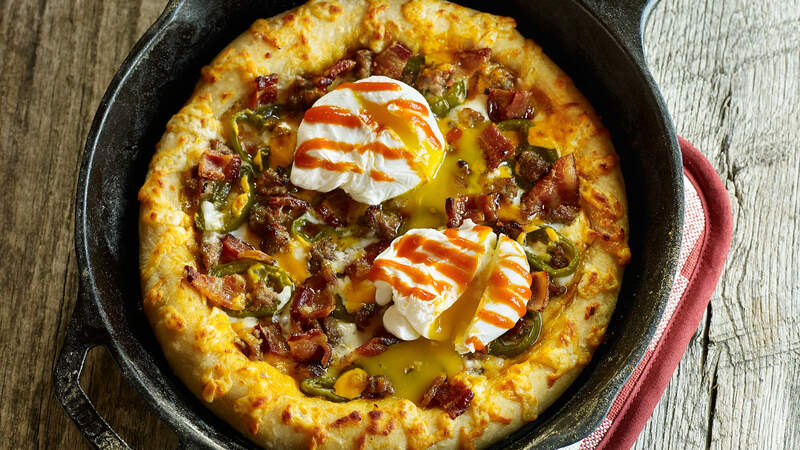 Break yolks open to run over pizza if desired. Serve hot.